(Newser) – "Dreams DO come true." 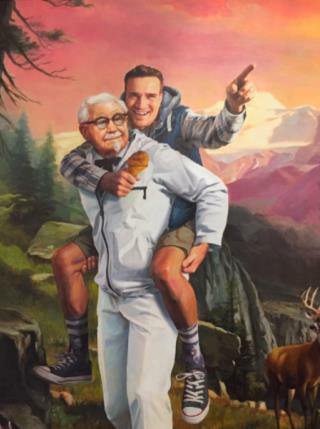 And for Mike Edgette, who tweeted just that on Saturday morning, his dream entailed receiving a painting depicting him riding piggyback on Colonel Sanders against a picturesque mountain landscape, all the while waving a KFC drumstick. Edgette tells Mashable he received the artwork, along with 52 $5 KFC gift cards and a note from the Colonel, apparently a symbol of thanks from the fast-food chain for his "genius" discovery last month that its Twitter account follows exactly 11 people: "5 Spice Girls and 6 guys named Herb." That is, 11 herbs and spices. As they said in 'Fried Green Tomato's" ~ ~ " Secret's in the sauce "
Before I saw the full picture, I thought the secret was going in the Colonel's back door.